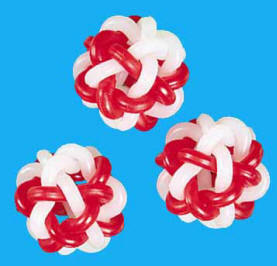 You get three (3) of these intertwined spaghetti balls that's a great foot toy or use as a component to make toys! You can even hang them using our ParroLink! 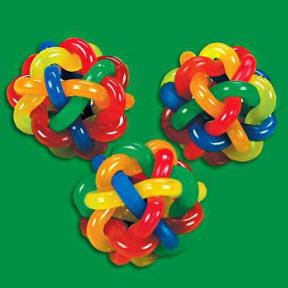 Lots of things you can do with these rubbery balls like hang them from a parrolink, put ParroStix through it or fill with nuts! This is a must have for those foot toy loving parrots in your house, perfect for most mid sized parrots like eclectus, greys, amazons, small macaws and cockatoos (and if your larger size parrot isn't a buzz saw beak, this toy would be a great choice, our large, male Greater Sulfur Crested 'too, Sydney loves this toy, especially when I put pine nuts in it)! Check out sticks & stones! 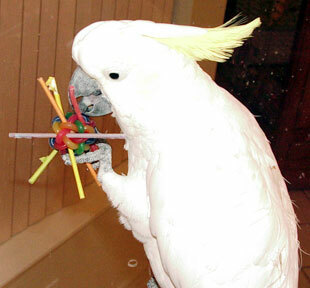 Check out the new 1" spaghetti balls too, they're perfect for the smaller fids in your house!